Dips and appetizers are supposed to be easy to make and always delicious, and that is exactly the case with our Easy Taco Dip recipe. It combines a large wheel of brie cheese and deliciously seasoned meat for the perfect, low carb appetizer to serve at your next party or movie night! You honestly can't go wrong when using all those flavors in combination! 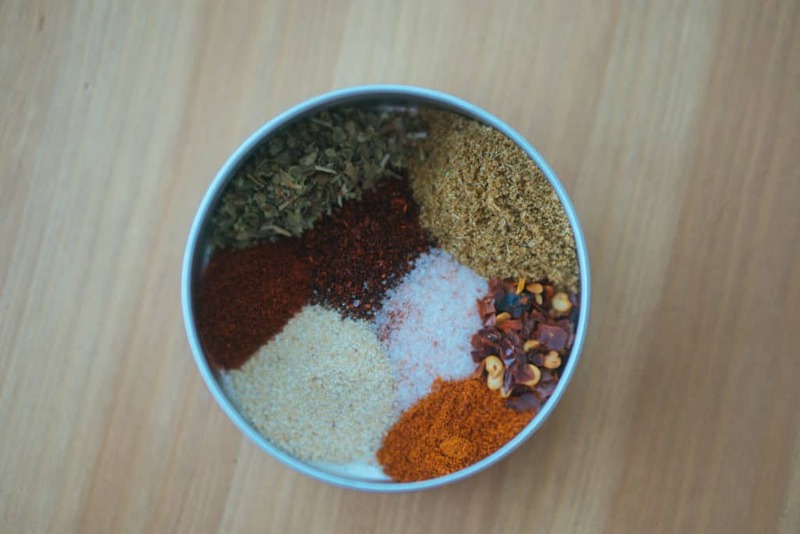 We always have all of those ingredients on hand because you can literally add them to any meat you are cooking and it will be delicious. You can even make it in bulk and store in on your counter top or in the fridge (for longer lasting freshness) and use it on the fly. 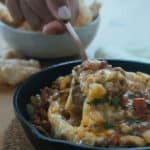 The Best Dip Recipes - Keto Style! To me, a good dip requires all around great mouth feel and lots of flavor. This easy taco dip recipe, for example, checks all the "best dip" boxes. It has spice, creaminess, crunch, and fatty meat. 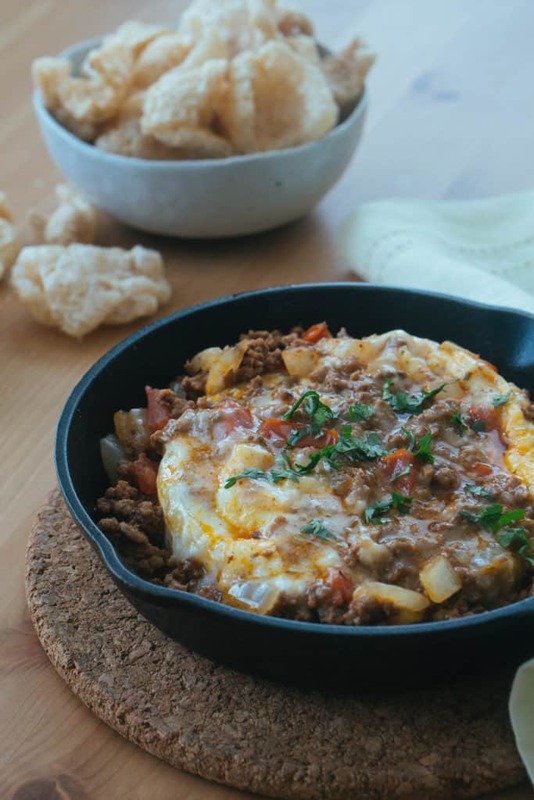 Some of my other favorite dips that fall into the "best dip" category would definitely be our low carb pizza dip and chorizo dip. I also love to make a big bowl off egg salad with bacon bits and scallions and use zucchini for dipping! When you combine high fat ingredients like cream cheese, heavy cream, and/or mayo you can't go wrong. That being said, dips can also be dangerous so do yourself a favor and portion it out into Tupperware containers if you make it in bulk so you don't regret that heavy feeling you often feel after stuffing yourself with dairy! 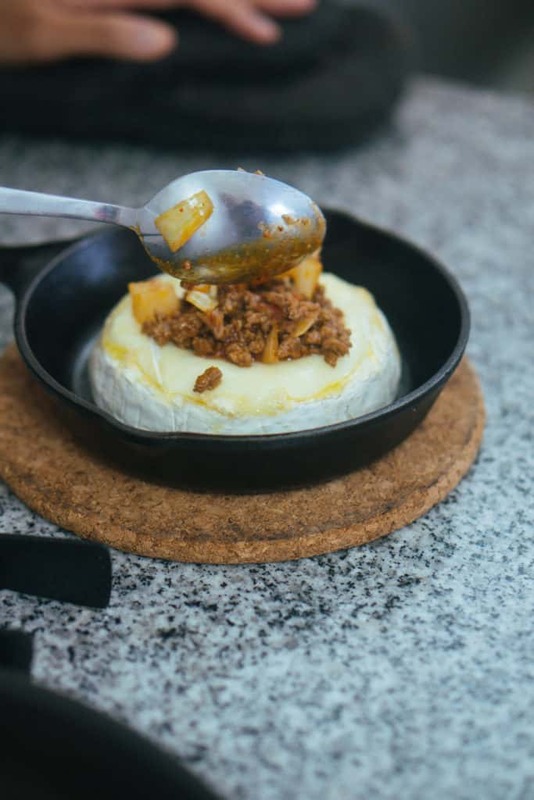 No matter how you fill your melted brie cheese wheel, just make sure you fill it up with something delicious. It doesn't have be taco meat by any means. You can do a pizza style one with pepperoni, onions and some tomato sauce or a buffalo chicken one with shredded chicken thighs and buffalo sauce. Just do yourself a favor and make this easy taco dip ASAP! 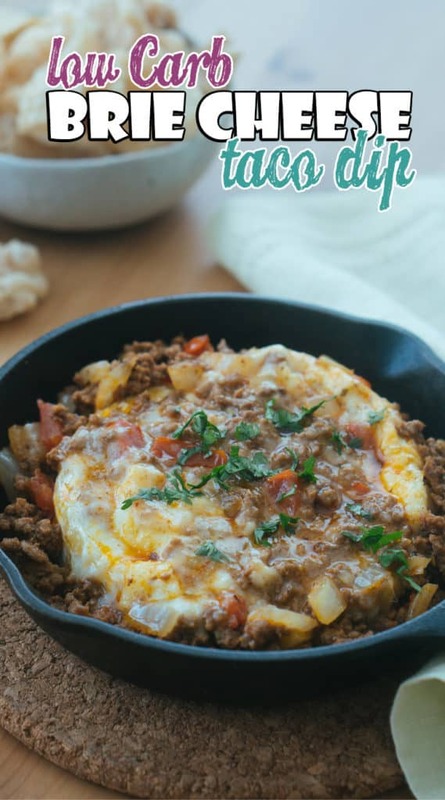 Recipe can be quickly added to MyFitnessPal - Search "KetoConnect - Easy Taco Dip"
Unwrap the brie cheese and using a knife make a rim around the top of the rind, leaving a small edge around it. Using your knife or your hand carefully peel off the rind exposing the cheese. 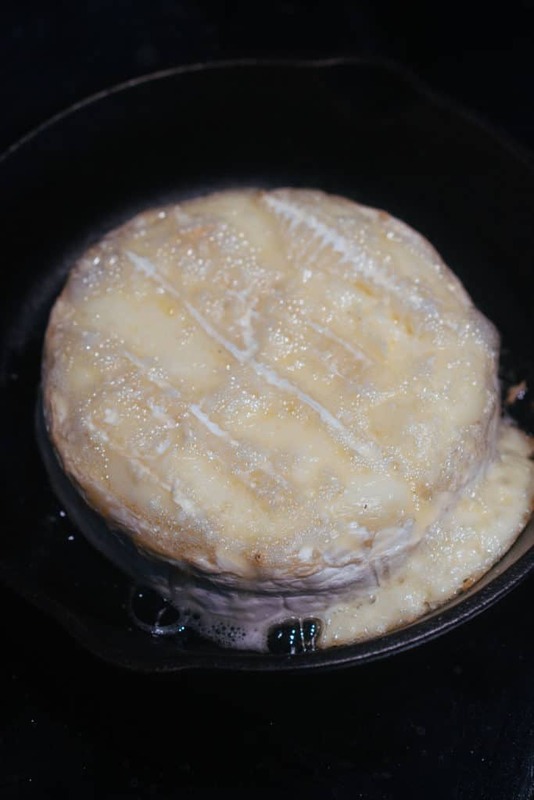 Place the cheese in an oven safe skillet (we used 6 inch) and bake for 20-25 minutes, until cheese is visibly melted. While the cheese is melting, heat a saucepan to medium high heat and add int he ground beef. once partially cooked add in the spices and onion and tomato. Cook for an additional 3-5 minutes until the onion and tomato are tender. Remove from heat and set aside until the brie is out of the oven. 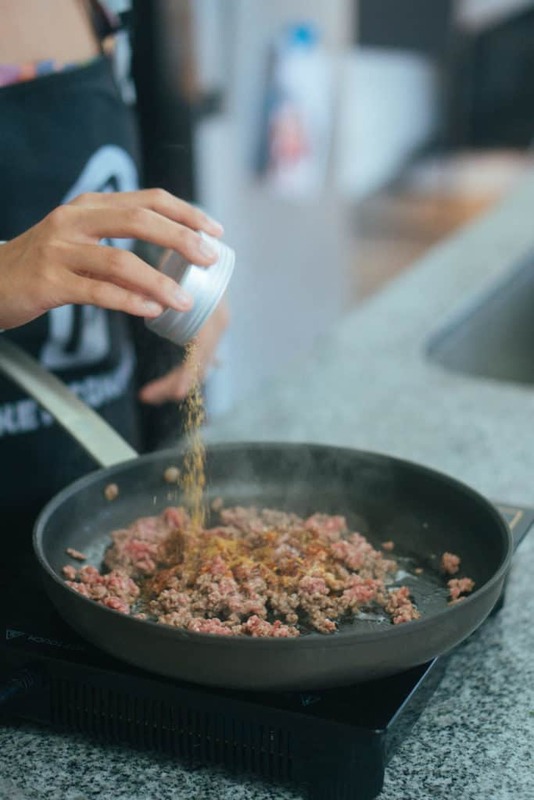 Once you remove the brie cheese, top it with part of the ground beef mixture placing the remainder beef along the edges. Combine using a spoon or tongs so the meat and cheese are incorporated. Serve immediately and enjoy with veggies, pork rinds or over cauliflower rice! Best stored in the fridge in a sealed container up to 7 days. Reheat in microwave, if desired or can be eaten cold.